How did you arrive at the conclusion that accuracy doesn’t matter? The Netflix quote and chart don’t seem connected to me. The quote refers to the massive ensembling used to achieve the challenge score threshold. 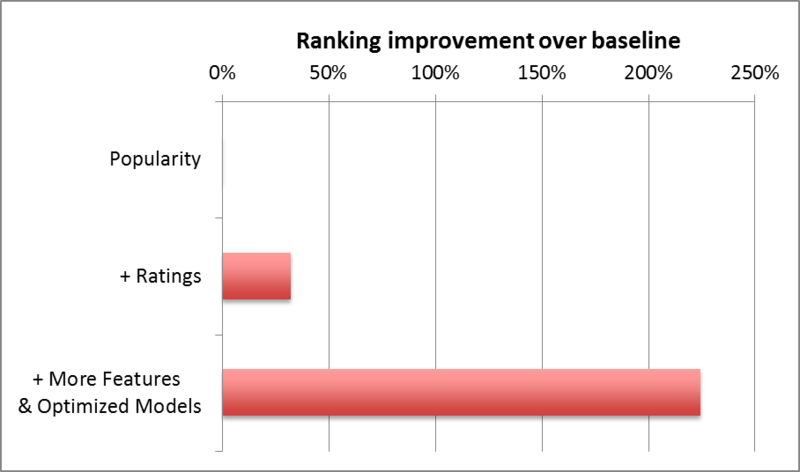 The chart seems to show that you can go a long way from the baseline by improving features and models. I’d say accuracy, or more generally, score used for evaluation, doesn’t matter _as long as it’s good enough_. However, it’s not that easy to arrive at “good enough”. Consider Spotify. I find their daily recommendations abysmal. Discover Weekly is much better, but still has room to improve. I agree. I said that predictive accuracy has some importance, but it is not the only thing that matters. You’re right about it needing to be good enough, where the definition of good enough is domain-dependent. Browsing is a comfortable and powerful paradigm (the serendipity effect). Search results don’t have to be very good. Recall? Not important (as long as you get at least some good hits). Precision? Not important (as long as at least some of the hits on the first page you return are good). 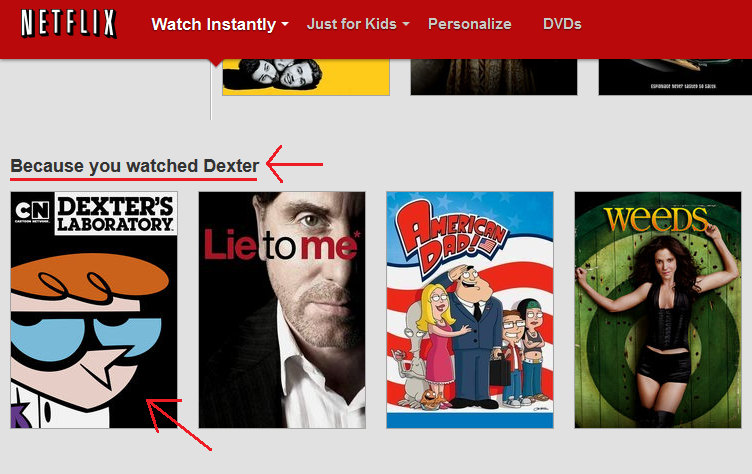 it does not clear to me why accuracy is not important in recommender and searching?? It is important, but its importance tends to be exaggerated to the exclusion of all other metrics. As I said in the post, things like the way you present your results (UI/UX) and novelty/serendipity are also very important. In addition, the goal of the system is often to optimise a different goal from offline accuracy, such as revenue or engagement. In such cases it is best to focus on what you want to improve rather than offline accuracy. By the way, I attended a talk by Ted Dunning a few months ago, where he said that one of the most important tweaks in real-life recommender system is adding random recommendations (essentially decreasing offline accuracy). This allows the system to learn from user feedback on a wider range of items, improving performance in the long run. would you please send me the ted talk’s tilte ? so I can watch it. Two points that were not discussed but I see it recurrently, at least in E-Commerce, it is how people underestimate the effort necessary to build an online realtime recommender system and overestimate its impact. Offline recommendations are enough for the majority of cases. The second one, there is an obsession with novel algorithms, when often bread and butter ALS + domain knowledge reflected in business rules bring better impact. Overall, really good overview, and I fully agree with all points! This was an excellent read – would highly recommend 😉 – thank you. Thanks a lot for giving an awesome overview of recommender systems. Have you considered writing a textbook on the topic? Hi! Thank you for the article. It a bit much help me for my project. However, can you suggest me any book or link that can show me how to apply the algorithm in coding? I guess it a little bit difficult. I do not found any article related to application of the algorithm in coding, especially in Java because currently I’m developing the recommender apps. I’m stuck at the algorithm. Hope you or anyone can help. Thank you! Thank you for your comment. You can check out Mahout in Action (https://www.manning.com/books/mahout-in-action) or Oryx (http://oryx.io/) for some examples. Hi Yanir, thanks a lot for a comprehensive article on recommender systems. What I’m interested in particular is a recommender systems for subscription box businesses, as in the case of BarkBox, Birchbox, Blue Apron, Harry’s, OwlCrate, Trunk Club, and Winc. What type of recommeder system do they use and why is beneficial?